Teenage girls at a displacement camp in Gwoca LGA, Borno State, Nigeria. Three Nigerian women will spotlight themes such as human trafficking, suicide bombing, and sexism and sexual harassment at the United Nations, showing the strength of women as agents of change in African societies often dominated by men. The event is organized by UN Women, the UN Population Fund (UNFPA) and the Nigerian Mission to the UN, with other partners. “Africa is a diverse continent, rich with different countries and different cultures and natural resources. Africa has the talent – men and women,” said Ms. Itua. Men and women alike, she said, must understand that women can be powerful agents of development. Her latest film, Mrs. Adams, – which will premiere during the Commission on the Status of Women (CSW) next week – follows human trafficking routes in Nigeria and Europe. It is meant to be a statement not just about brutalization of women and sexual violence, but also highlight the economic reasons that people choose to migrate in the first place. It also hopes to raise awareness about the exploitative work practices, forced labour and smuggling that are rife in human trafficking. She will be joined on Sunday by 24-year-old Nadine Ibrahim, whose film Through Her Eyes follows the internal struggle of a 12-year-old female suicide bomber in northern Nigeria. Ms. Ibrahim, who is a Muslim, says that she wants people to understand the rich and beautiful culture surrounding women, Islam and north-eastern Nigeria. The film was filmed on location with security, and after the original actress’s mother pulled the daughter out of the film for fear of safety. Speaking to UN News from the airport enroute to New York, Ms. Fafunwa said it was incredibly relevant for HEAR WORD! to be showcased at the UN. The award-winning playwright added that the timing is particularly relevant given that Nigerians are grappling with the abduction of another 100 girls by Boko Haram. “It is important that we join in initiating these discussions. It also presents an opportunity to shift perceptions about what is possible for Nigeria and Nigerian women,” Ms. Fafunwa added. Cognizant of the many young women who will be looking at the UN during the coming two weeks of the commission sessions, Ms. Fafunwa reflected on the possibilities that youth hold. 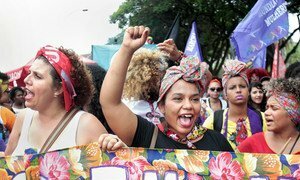 This year, International Women’s Day comes at a pivotal moment, and with a wave women’s activism – from the #MeToo movement to #TimesUp and beyond – exposing the structures that have allowed women's oppression to flourish, the United Nations is urging the world to stand with rural and urban women activists to topple the remaining barriers to gender equality and empowerment.